Image2PDF (Image to PDF) is a Windows application which can directly convert dozens of image formats, such as TIF, TIFF, JPG, JPEG, GIF, PNG, BMP, PSD, WMF, EMF, PCX, PIC and so on, into PDF format. Image2PDF can automatically clear and skew-correct B/W images by employing special techniques to insure high quality output after conversion. Image2PDF can operate independently of Adobe Acrobat and has faster processing speed. If your application doesn't require OCR (Optical Character Recognition) functionality, Image2PDF provides a very convenient, simple way to compose electronic books which can then be issued to the Web. You can scan paper documents directly to image files and then convert them to PDF using Image2PDF. We also provide a command line version of Image2PDF (which allows you to manually issue commands or include them in scripts) as well as a CGI process which will allow, for example, a web site or intranet to convert TIFF or other image files to PDF on the fly. Image2PDF is perfect for high-volume document archive/database systems that require unattended batch image conversions (TIFF or other images) to PDF format. 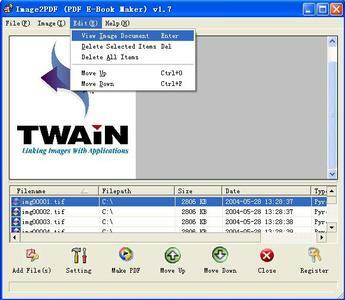 If you need create searchable PDF files from input image files, please look at Image2PDF OCR product.